In the last tutorial, we looked at textures that were not pictures. Now, we will look at textures that are pictures. However, unlike the last tutorial, where the textures represented some parameter in the light equation, here, we will just be directly outputting the values read from the texture. Before we begin however, there is something you may need to do. When you installed your graphics drivers, installed along with it was an application that allows you to provide settings for your graphics driver. This affects how graphics applications render and so forth. Thus far, most of those settings have been irrelevant to us because everything we have done has been entirely in our control. The OpenGL specification defined almost exactly what could and could not happen, and outside of actual driver bugs, the results we produced are reproducible and nearly identical across hardware. That is no longer the case, as of this tutorial. Texturing has long been a place where graphics drivers have been given room to play and fudge results. The OpenGL specification plays fast-and-loose with certain aspects of texturing. And with the driving need for graphics card makers to have high performance and high image quality, graphics driver writers can, at the behest of the user, simply ignore the OpenGL spec with regard to certain aspects of texturing. The image quality settings in your graphics driver provide control over this. They are ways for you to tell graphics drivers to ignore whatever the application thinks it should do and instead do things their way. That is fine for a game, but right now, we are learning how things work. If the driver starts pretending that we set some parameter that we clearly did not, it will taint our results and make it difficult to know what parameters cause what effects. Therefore, you will need to go into your graphics driver application and change all of those setting to the value that means to do what the application says. Otherwise, the visual results you get for the following code may be very different from the given images. This includes settings for antialiasing. We will start by drawing a single large, flat plane. The plane will have a texture of a checkerboard drawn on it. The camera will hover above the plane, looking out at the horizon as if the plane were the ground. This is implemented in the Many Images tutorial project. The camera is automatically controlled, though it's motion can be paused with the P key. The other functions of the tutorial will be explained as we get to them. If you look at the BigPlane.xml file, you will find that the texture coordinates are well outside of the [0, 1] range we are used to. They span from [-64, 64] now, but the texture itself is only valid within the [0, 1] range. We set the S and T wrap modes to GL_REPEAT. This means that values outside of the [0, 1] range wrap around to values within the range. So a texture coordinate of 1.1 becomes 0.1, and a texture coordinate of -0.1 becomes 0.9. The idea is to make it as though the texture were infinitely large, with infinitely many copies repeating over and over. It is perfectly legitimate to set the texture coordinate wrapping modes differently for different coordinates. Well, usually; this does not work for certain texture types, but only because they take texture coordinates with special meanings. For them, the wrap modes are ignored entirely. You may toggle between two meshes with the Y key. The alternative mesh is a long, square corridor. The shaders used here are very simple. The vertex shader takes positions and texture coordinates as inputs and outputs the texture coordinate directly. The fragment shader takes the texture coordinate, fetches a texture with it, and writes that color value as output. Not even gamma correction is used. 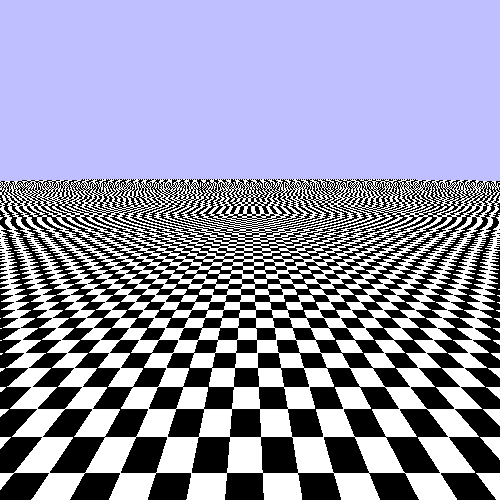 The texture in question is 128x128 in size, with 4 alternating black and white squares on each side. Each of the black or white squares is 32 pixels across.